For the second consecutive quarter, average flight hours exceeded the 30-hour ceiling and reached levels not seen since 2008. 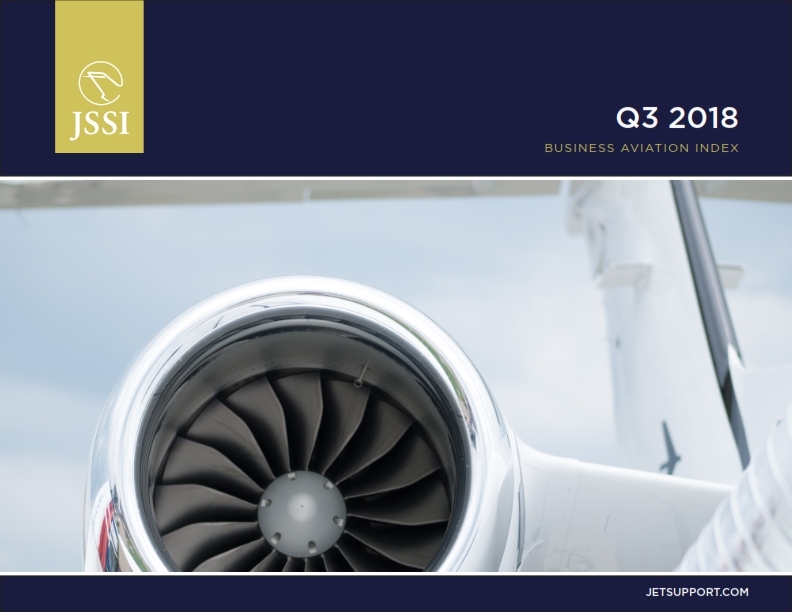 The JSSI Business Aviation Index tracks and reports on the global flight activity and utilization of approximately 2,000 business aircraft. Each report summarizes the average flight hours flown per aircraft on a monthly basis and organizes this data into key categories and nine regions. Average aircraft utilization of 30.34 hours for the third quarter is the first time flight activity has averaged over 30 hours in back-to-back quarters in more than a decade. The helicopter industry continues to rebound in 2018, with a 21.9 percent increase in average flight hours in the third quarter. Of the nine industries analyzed, six reported an increase and three reported a decrease in quarter-over-quarter flight activity. The largest growth was in the healthcare sector, which reported a 7.9 percent increase in flight activity compared to the second quarter of 2018. The construction industry reported an increase of 4.0 percent; the business services sector reported an increase of 2.6 percent; the power and energy segment increased by 2.3 percent; and the aviation sector saw a flight activity increase of 1.7 percent this quarter. The financial services industry increased by 1.6 percent. The largest year-over-year decreases in flight activity were seen in the manufacturing sector, with an 11.8 percent reduction; and in the real estate sector, which reported a decrease of 9.9 percent. The consumer goods industry remained relatively flat for the quarter, with a decrease of 1.0 percent from the second quarter but an increase of 6.0 percent year over year. Seven key regions are sampled in the index. Significant quarter-over-quarter increases were reported in the Middle East, with a 39.4 percent increase in average flight hours; and Africa, which reversed its negative trend for the year with a 37.6 percent increase. South America also experienced an 11.4 percent increase for the quarter. Decreases were seen in Central America, with a drop in average flight hours of 15.7 percent; Asia-Pacific decreased by 8.7 percent, and Europe ended the quarter with a 1.4 percent decrease. North America flight hours increased 1.6 percent quarter over quarter and 6.8 percent year over year. Average flight hours increased 5.7 percent year over year.